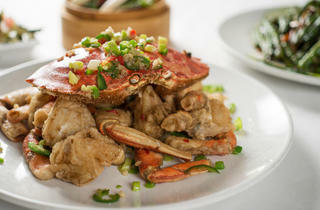 Photograph: Andrew Nawrocki Spicy and Salted Crab at Silver Seafood Restaurant. Seafood’s the name of the game at this modest Chinese staple, so start off right with clams bathed in a spicy black bean sauce or a huge spicy-and-salted crab, deep fried and tossed with onions and peppers. Not feeling seafood? A dish of Szechuan string beans adds some green to the table, while the crispy chicken is a half or whole bird with golden, crackly skin and fresh lemon and spiced salt. El stop: Red to Lawrence. Bus: 22, 36, 81, 92, 148, 151.